Glaucoma describes a neurodegenerative condition of the optic nerve, which eventually leads to blindness. In humans, elevated intraocular pressure is one of the major risk factors for developing glaucoma, however, in veterinary medicine glaucoma is always associated with elevated intraocular pressure. In order to understand the mechanisms of glaucoma, it is necessary to understand the normal flow of fluid that maintains the intraocular pressure. The intraocular fluid, also known as aqueous humor, is produced behind the iris in the ciliary body. This fluid flows through the pupil and drains from the eye at the iridocorneal angle, a sieve-like network located between the iris and cornea. Aqueous humor is produced and passed from the eye at approximately the same rate, resulting in a stable pressure within a range of 15 to 25 mmHg (millimeters of mercury). When fluid flow out of the eye is compromised, intraocular pressure rises above normal. High pressures lead to death of the cells, which make up the optic nerve and retina and blindness ensues. In general, there are two broad categories of glaucoma: primary and secondary. Primary glaucoma occurs without any previous ocular disease. It is known to occur within certain purebred breeds of dogs and thought to have an inherited basis. Primary glaucoma can be further divided into open-angle and narrow or closed angle. Open angle glaucoma is common in human patients but is very rare in veterinary patients. Narrow or closed angle glaucoma occurs as a result of a defect in the development of the normal intraocular drainage system, termed goniodysgensis. Secondary glaucoma is a consequence of another primary ocular disease that interferes with the natural flow of ocular fluid. Diseases that commonly cause secondary glaucoma include ocular inflammation, lens dislocation, and ocular trauma. Glaucoma results in blindness by blocking the nerve impulse through the optic nerve. Once the optic nerve has been permanently damaged, vision cannot be restored. With early, aggressive, and appropriate medical and surgical therapy, vision may be restored. Unfortunately with extreme elevations of pressure, the eye becomes permanently blind and painful. Even if the ocular pressure is restored to normal, enough changes may have occurred already for the eye to remain blind. The aim of therapy at this point is to maintain a cosmetic, pain-free eye and a comfortable patient. The diagnosis of glaucoma is based on history, clinical signs, tonometry, and gonioscopy. Redness of the conjunctiva (white part of the eye), clouding of the cornea, dilation of the pupil, and pain are common clinical signs of glaucoma. In the later stages, the eye may become enlarged. Tonometry is the measurement of intraocular pressure. A variety of techniques can be used to estimate intraocular pressure, including Schiotz tonometry, applanation tonometry, and rebound tonometry. Gonioscopy is a technique used to evaluate the iridocorneal angle. It involves placing a dome-shaped contact lens (goniolens) on the corneal surface. This lens permits the direct visualization of the drainage angle. Gonioscopy occasionally requires sedation, but in calm and cooperative patients, it can be performed with topical anesthetics alone. This technique is essential in determining the nature of the glaucoma and will provide insight as to whether the unaffected eye is at risk for developing glaucoma. After the initial diagnosis of glaucoma is made, the patient is generally treated with aggressive medical therapy. This may require a brief period of hospitalization. During periods of hospitalization, osmotic diuretics may be given orally or intravenously to reduce the intraocular pressure quickly. Once the pressure has been controlled, maintenance levels of medications are prescribed for long-term therapy. Medications that are commonly used include those that are aimed at improving the outflow of aqueous humor or suppressing its production. Drugs that can improve aqueous outflow include pilocarpine, demacarium bromide and latanoprost. Other medications designed to reduce the aqueous production include carbonic anhydrase inhibitors and beta-blockers. Unfortunately medical management of glaucoma is often unsuccessful in veterinary patients, and the initial response to medication may be short-lived. In many instances, it is impossible to control the pressure with medications alone and a variety of surgical techniques have been developed to aid in the control of pressure. Surgeries for glaucoma can be divided into vision saving procedures and surgeries of comfort. Vision saving procedures are an option for patients with acute glaucoma that still have vision. Once an animal has lost vision due to glaucoma, these surgeries are of no benefit. Cyclophotocoagulation - In this procedure a laser is used to kill a portion of the cells in the ciliary body which produce aqueous humor, thereby reducing the rate of fluid production. Unfortunately the laser energy can create significant inflammation inside the eye which may exacerbate the glaucoma in the days following the procedure. Intraocular hemorrhage and cataract formation (if performed by a transcleral approach) are uncommon, but are potential complications. Over time, the fluid-producing cells may regenerate leading to the recurrence of high pressure, necessitating a repeat procedure. Gonio implants In order to facilitate outflow of fluid from the eye, a drainage device can be surgically implanted. A tube is placed inside the eye which drains through a pressure-regulating valve placed beneath the mucous membrane surrounding the eyeball. This procedure can be very effective, however, over time, the body will create scar tissue surrounding the implant causing it to fail. Published reports give an average of 6 months before the implant stops working, although success times of over a year are not uncommon. Cyclophotocoagulation is usually performed in combination with this surgery. 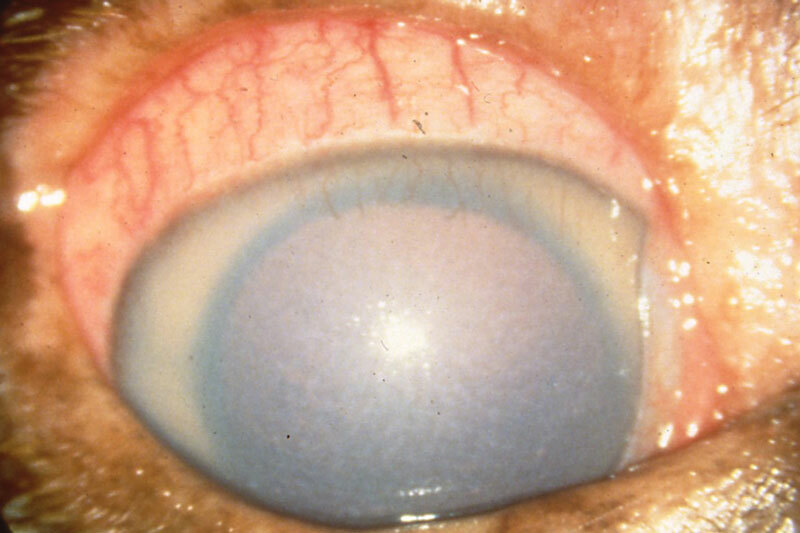 Complications of this surgery include intraocular hemorrhage, inflammation, infection, and migration of the implant. If too much inflammation occurs within the eye, obstruction of the draining tube can occur. Surgeries of comfort are discussed in more detail in another handout. Unfortunately, glaucoma remains a leading cause of blindness in animals. Because of the insidious nature of the disease, many animals are presented at a time when it is not possible to restore vision to the initially affected eye. The goal of the veterinary ophthalmologist in treating the patient with glaucoma is to restore vision where possible and to maintain a cosmetic, pain-free eye. Glaucoma is seldom diagnosed early enough to restore vision in the first eye affected. Therefore, during the initial examination, time will be spent to evaluate the “good” eye. Prognosis is dependent upon early diagnosis, appropriate medical therapy, and regular and consistent re-evaluation.